Average retail gasoline prices in Alabama have fallen 3.7 cents per gallon in the past week, averaging $2.02/g yesterday, according to GasBuddy's daily survey of 3,348 gas outlets in Alabama. This compares with the national average that has fallen 6.1 cents per gallon in the last week to $2.39/g, according to gasoline price website GasBuddy.com. Including the change in gas prices in Alabama during the past week, prices yesterday were 117.6 cents per gallon lower than the same day one year ago and are 19.4 cents per gallon lower than a month ago. The national average has decreased 20.2 cents per gallon during the last month and stands 103.7 cents per gallon lower than this day one year ago. "Not only did Labor Day weekend see millions of Americans take to the road and spend far less than they did last year at the pump, but a growing number of them were able to fill up at under $2/gallon for the summer's last hurrah," said Patrick DeHaan, GasBuddy senior petroleum analyst. 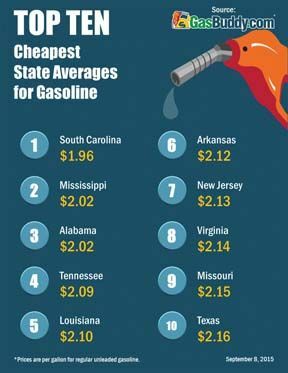 "Better than one in ten stations in the country now offer gasoline prices at $1.99/gal or less, and gas prices in 48 of the nation's 50 states fell in the run-up to the holiday itself, showing that holidays aren't always a catalyst for price increases. The Midwest led the biggest decliners, again, and prices in some of these states now stand a staggering dollar per gallon lower than they were just last month after the BP refinery issue led to spikes, a stunning and quick reversal. As we begin to near the terminus for summer gasoline, I expect prices to continue moving lower, with our projections aiming at a sub-$2/gal average by Christmas--or perhaps even earlier," DeHaan said.